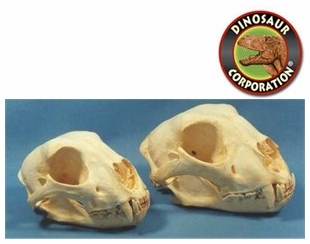 Cheetah skull replica is cast from original specimen. Acinonyx jubatus; female. California Academy of Sciences. The cheetah (Acinonyx jubatus) is a large feline (family Felidae, subfamily Felinae) inhabiting most of Africa and parts of Iran. It is the only extant member of the genus Acinonyx. The cheetah can run faster than any other land animal� as fast as 112 to 120 km/h (70 to 75 mph) in short bursts covering distances up to 500 m (1,600 ft), and has the ability to accelerate from 0 to 100 km/h (62 mph) in three seconds.